When the asymmetrical spinnaker was first introduced decades ago, it quickly became apparent that boats with different “poles” sailing together had to play the game a bit differently. 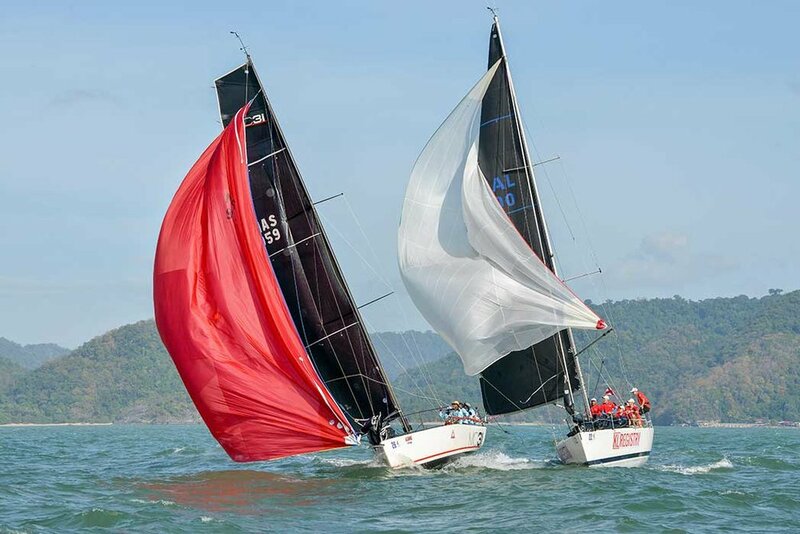 Because boats with traditional symmetrical spinnakers can run deeply downwind, and sprit boats need to sail higher reaching angles downwind, their proper courses are different. This meant that when the converged on downwind legs on the same gybe, each boat needs to anticipate how best to deal with the crossing most effectively. One has to remember, that in luffing matches, boats with asymmetrical spinnakers can sail high; therefore, they have the advantage. RRS rule 11 says that the windward boat shall keep clear of a leeward (ROW) boat and the leeward boat can sail her proper course defined as the course to get to the next mark most efficiently. If the a boat with an asymmetrical spinnaker is to leeward of a boat with a symmetrical spinnaker, the skipper of the symmetrical boat has to put on his thinking cap sooner than later. In the photo above, a symmetrical spinnaker boat is trying to pass to windward of an asym boat. Hummm? Sound like a good idea to you? Not really. The leeward boat’s proper course will take the windward boat above her proper course. The alternative would have been for the sym boat to have gybed and passed behind the asym. Going behind allows the symmetrical boat to sail her proper course with clear air and without any drama. Instead, there’s a fire drill going on aboard both boats as the windward boat gets pushed above her desired course. To have avoided this would have required the tactician on the sym boat to have anticipated the situation and had the crew ready for a clean maneuver to avoid the asym before converging rather than having to pull the fire alarm. Here the windward boat has to call out Plan B...stalling the spinnaker, slowing down their boat, and passing safely astern of the sym. Newer PostTHE BEST USE OF WOOD SINCE…THE CIGAR BOX!